I've shown a lot of work at the Manayunk-Roxborough Art Center over the last six months. Each month members have one wall on which they can show so there's always the opportunity to show at least one work. 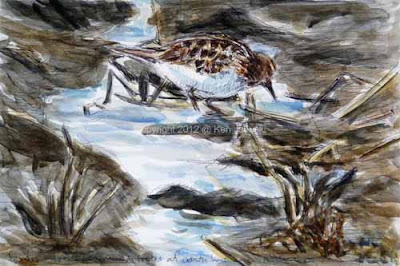 I've shown so much bird art recently that I debated doing a new watercolor based on landscape, or perhaps a dragonfly or butterfly. As I looked through my landscape photos I came across one of the beautiful salt marshes surrounding Nummy Island near Cape May in New Jersey. 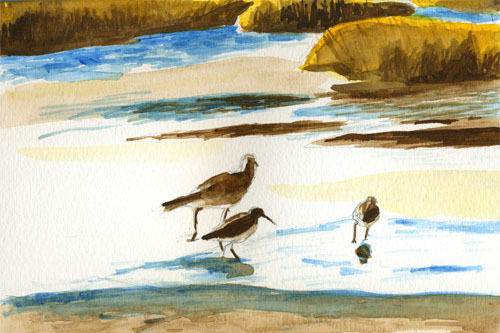 That reminded me that one of my very first bird watercolors, and certainly the fist one that I thought even marginally successful, was based on three shorebirds at Nummy Island. That prompted me to do a new version of it. The new version, on 9x12 inch Arches 300# cold press watercolor paper, is a top. The little 5x7 or so watercolor from five or six years ago is beneath it. The new watercolor is quite different and shows, I hope, that I've learned a little bit about watercolor over that time. But the poses are still pretty much the same. I liked those poses sic years ago and I still like them now. But they seem best small and simplified, an accent in a beautiful landscape. By the way the next show at MRAC opens this Sunday. Unless I ruin it this watercolor will be on the member's wall. (Well I didn't ruin the watercolor but it's not hanging nonetheless. A mistake at gallery caused it not to be hung. It will go onto my online store instead). 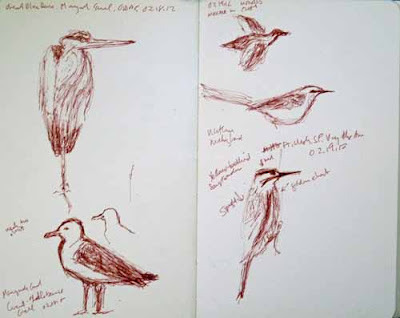 The Great Backyard Bird Count last weekend put my studio work on hold though it did have the positive effect of getting me to do a fair amount of field sketching. Now that I'm back in the studio though I keep searching for the subject of a new linocut. I got a new baren and a new type of printing paper over the Christmas holidays and would like to put them to use. But linocuts are always a very roundabout process for me. At some point in the middle of sketching, or painting, or looking at old sketches and paintings, maybe even photos I'll suddenly get the bright idea that I should make a lino based on whatever I'm looking at. But sometimes I can look and look, sketch and sketch and just not come up with an idea. That's the case right now. 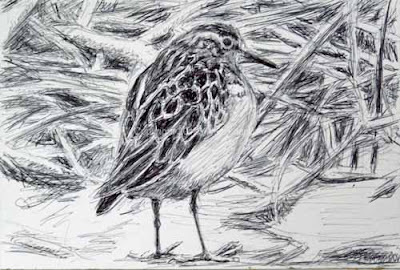 As i looked through some old photos of a Least Sandpiper in the muddy fields near Magee Marsh in Ohio last May I decided to do the ballpoint pen sketch at top. I can't imagine I'll ever use it as a lino but I think it's valuable on its own. The sandipers were almost invisible in the dark mud and the small stream of water created by heavy rains. I tried to get that across in the second work at top, an ink drawing with watercolor on top. I thought maybe it could be the basis of a lino before I started. But the end result leaves much to be desired. I can't see it as a lino at the moment. I'd also done some new warbler studies in ballpoint pen before the Great Backyard Bird Count. But I never got around to showing them. Tbey are above, male and female Magnolia and Canada Warblers. Today was another beautiful sunny but crisp day. This years Great Backyard Bird Count has had some wonderful weather. For me the rare bird in this area that I wanted to make sure I added to the count is the Red-headed Woodpecker that I first found along the Wissahickon back in October. I haven't done any field sketches since then so today seemed the perfect time. 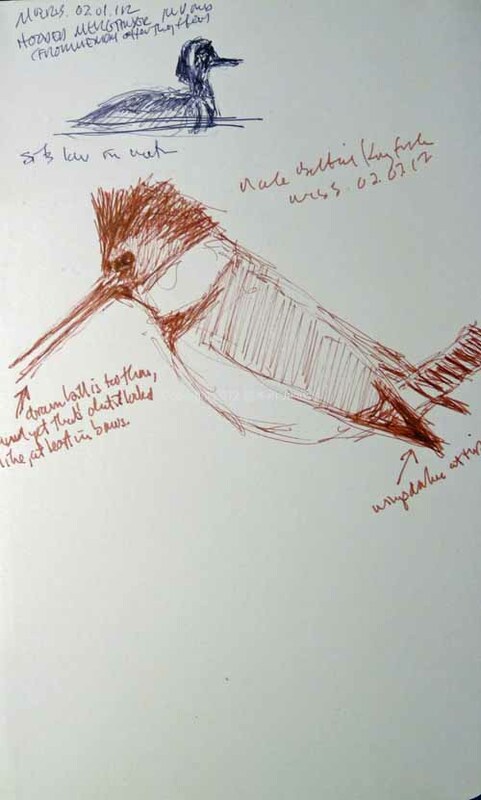 The bird is pretty much at the limit of my binoculars (and cameras) vision so it's always hard to see enough detail to more than just a sketch. Other birds seen today included a female Wood Duck, the first I've seen in 2012, numerous White-breasted Nuthatches, shown above, and the ubiquitous Mallards and Canada Geese at Valley Green. I normally don't do much field sketching in February. Thanks to GBBC for giving me the incentive to get out and do some on each of the four days. I managed to get out for a couple of hours yesterday for GBBC and then today we were out for about three hours at two locations. We didn't find any rarities though the Yellow-bellied Sapsucker from today was bird number 50 for the year and our first Yellow-bellied Sapsucker of 2012. 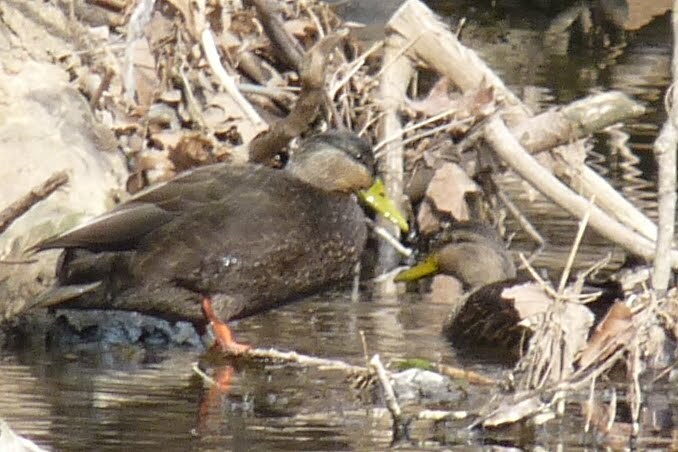 We may also have seen our first American Black Ducks of the year. But I can't say for sure. I'm just not that familiar with them. I include a couple of photos at bottom. 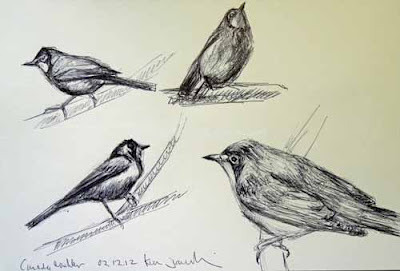 As I've mentioned there's always a decision to be made if I see a bird and have both sketchbook and camera. Which shall I use? I don't have any good photos of Yellow-bellied Sapsuckers though I do have numerous bad ones. Today's was particularly close to us just off the pedestrian bridge at the Flourtown Day Use Area of Fort Washington State Park near Philadelphia. But I stuck to my guns and spent my brief time trying to sketch it. If I'd had my camera unpacked from its carrying back and ready to shoot I might have tried it. But I'm glad I didn't. I always learn more from sketching. In this case one of the things I learned is that the bill is longer than I'd ever noticed, though a bit shorter than in my sketch. I also noticed the black line coming off the bill and onto the face. Unfortunately I didn't notice how it makes a turn and goes back into the throat, nor that the black line through the eye is at a 45 degree angle to the forehead not perpendicular. These are the types of things that I generally learn when I field sketch. I put down what I recall seeing and then later compare it to reference photos and field guides. 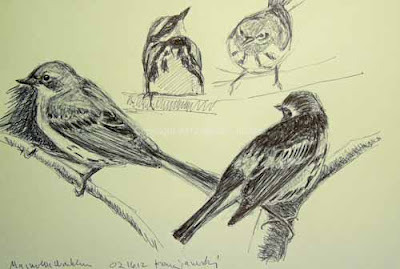 It's much easier to do this if I have a scope and can keep a constant eye on the bird while I sketch. I don't need one hand holding up the scope. But with binoculars I need to hold them up to my eyes with two hands, try to get a detail or impression, then put them back down and use my hands to hold sketchbook and pen or pencil. It's this back and forth that leads to errors. 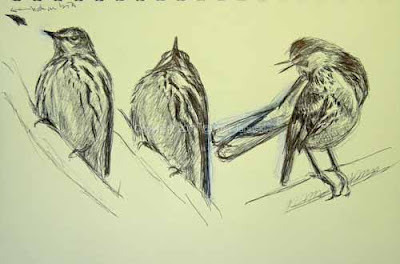 The other option is to just keep your eye on the bird, even with binoculars and only try to sketch if after it's left. That's what I did with the Mallard in flight and the Northern Mockingbird above. It's also a useful method and sometimes works out well. With it also I later go back and compare what I've put down to photos and guidebooks. The Sapsucker, Mockingbird and Mallard are all from today. Yesterday I saw a Great Blue Heron and my first Great Black-backed Gull of 2012 at the Manayunk Canal. Both stayed put for quite a while though the heron longer than the gull. I was able to spend at least 10 minutes on the heron. I've done so many of them now that I'm starting to get comfortable. Gulls are another story. Even though some of them, like Ring-billed, are common they're never common where I bird. So I don't have much practice with them. 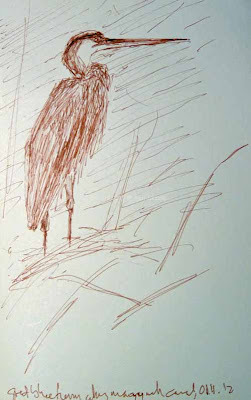 Sadly that shows in this sketch of the Great Black-backed Gull. But any mistakes are active mistakes, done when I'm actively engaged with looking at the bird. They are far more educational than those made while using a photo. In any case I always enjoy taking part in the Great Backyard Bird Count. This year I've enjoyed it even more by also doing field sketches. One more day left tomorrow so we'll see what that brings. Above the ducks that MIGHT be American Black Ducks. This was an instance where it seemed worthwhile to unpack the camera and take a couple of shots. For quite a few years now we've tried to take part as much as we could in The Great Backyard Bird Count. This year was no exception and today we spent over three hours at Houston Meadows in the northwest section of Fairmount Park and the Wissahickon Valley. The count continues through Monday. Before we even got out of the car we saw HUGE flocks of birds. We tried to hurry to get out and grab our binoculars from the back of the car before they scattered. We didn't quite make it in time. Part of the flock though, 100+ American Robins, stuck around and were easy to identify. The cacophony of the departing and much larger flock made us both think Common Grackle but we weren't sure. Red-winged Blackbirds can also be loud and we're not used to seeing them in flocks. Later in the day though as we neared Bells Mills Road we got a good look at either the same flock or an equally large one. They were definitely grackles, so many as to almost blacken they sky when they flew. At top is one of my runny ink and watercolor versions of the scene. It's quick and sloppy, based on some photos that I took. But I think it gives some sense of the scene. And of course with grackles there's a sort of metallic cacophony that accompanies the visual display. It was a great way to see our first Common Grackles of 2012. Other highlights were a Hairy Woodpecker, numerous Eastern Bluebirds and Chipping Sparrows along with 21 other species, and some blooming snowdrops. One reason that we've always enjoyed this bird count as well as the other winter bird counts that we take part in is that we always find something new. Nature is always changing. And though it may not seem like spring nature always shows some hints of the season that is on its way, ready to displace the current one. 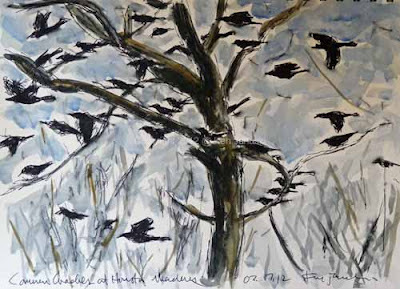 Huge flocks of Common Grackles are a sign of northward migration. Migration is starting. Soon spring will be here. 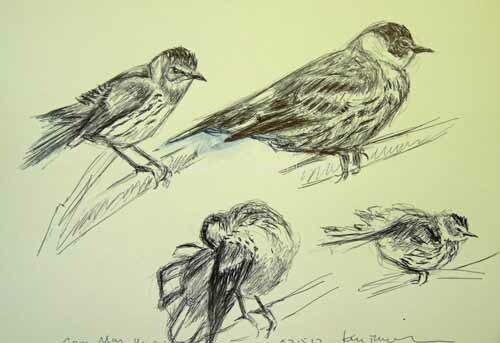 I have also done some new ink studies of warblers but I'm going to hold off on showing them for a bit. Hopefully there will be more to show from the next three days of the count. 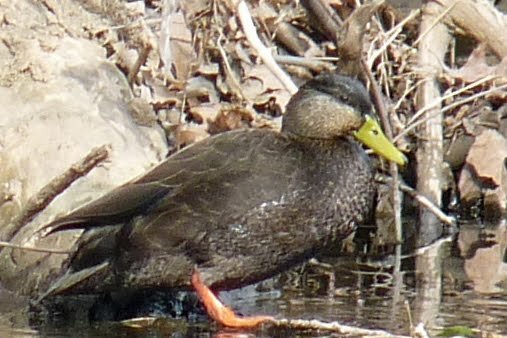 Our trip to the Biggest Week in American Birding at Magee Marsh in Ohio last spring was memorable in many ways. At the top of the list though was the number of migrating wood warblers in full breeding plumage that seemed to be everywhere. I did stick to my plan and try to do as much field sketching as possible. This is always difficult when you know you probably won't get such good looks at some of these birds again for many years. Wouldn't it be better to just take photos? Well that certainly was a temptation but I'm proud of myself for sticking with my plan and doing numerous field sketches. I also took photos but I concentrated on sketching. But winter always seems to be the time for me to look through the photos that I have taken and do some drawings based on them. So I'm making use of some of the photos I took at Magee of Cape May Warblers here. 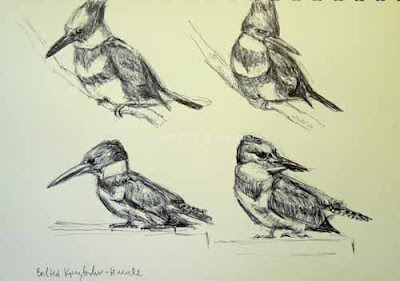 The sketches above are based on those photos. In many of them a Cape May Warbler had just bathed in the stream in front of us and had hopped back up to preen and rearrange his feathers. Most of the photos show him in motion and I've also tried to portray that in some of the sketches. It's all part of what birds actually look like. If you've ever seen a Cape May Warbler in breeding plumage you might wonder how I can stand to portray it in black and white. I love its color though my wife thinks that they're over the top. I'm sure I'll get to something in color eventually but for now I'm concentrating on structure. I can already see on mistake I've made in that in these drawings. We also got some very good looks at numerous Blackburnian Warblers. I did do a multi-color reduction linocut based on them as well as a couple of watercolor sketches. But it's always good to study their structure again. These sketches are based on Magee photos as well as some from Shenandoah National Park. 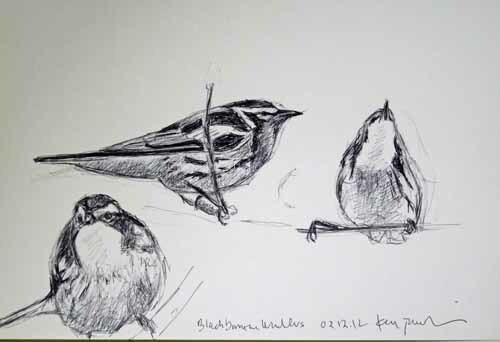 And speaking of Shenandoah National Park above are some sketches of Canada Warblers based on photos I've taken there over the years. Some of my very first bird drawings when I took up birds as subject about six years ago were these same Canadas. That was when I first realized how deceptive photos can be and how hard it is to make sense of an unclear area in a photo if you don't really understand the structure of the subject. Thankfully I've learned a bit more about structure during the last six years. Not that there's not still a long, long way to go. Continuing on with the thought of preparing myself for doing field sketches of wood warblers when they arrive for their brief spring visit I've returned to my photos of them and done some ballpoint pen studies. Above are some Black-throated Greens. Though the most striking thing about these warblers is their color you really can't do justice to that without being able to draw the structure of the bird. Many of these photos were taken at Magee Marsh in Ohio last year where warblers seemed to drip from the trees. Above are Black-throated Blues. Though we saw many of them at Magee we also see very many here in Philadelphia, especially in the fall. These sketches are all based on photos I took in Philadelphia over the last couple of years. The striking colors or warblers can almost hypnotize you. 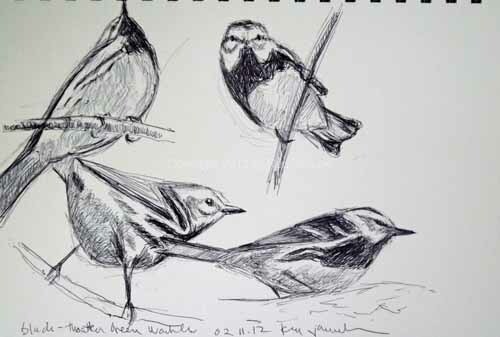 I always find that when I try to draw them in the field the thing that has stuck in my mind is a field mark, for example the black throat of either Black-throated warbler. But I don't remember the structure. In fact I don't even SEE it. I'm too struck by the colors and patterns, and of course the fact that the bird has now flown. In any case I hope that these studies might help a small bit in creating a mental imprint on my mind of their structure. These sketches are all ballpoint pen as I've mentioned. You might think the finality of ink would be inhibiting. But for me it's much better than the ephemerality of pencil. You never know when your fine, carefully drawn fine lines are going to smudge away to a blur. With ink you're sometimes stuck with a line that is wrong. Your mistakes show. But I think it's easier to cover over them and have lines that stay as you made them than to worry about smudging pencil. It is surprising to find ink such a rewarding medium. I used to draw with India ink and liked it for the same reasons. But I've only recently tried ballpoint pen, thanks mainly to two artists I often see at Birdforum, Alan Dalton and Paschalis Dougalis. More than anything else their work convinced me to give it a try. I'm glad I did. As much as I enjoy doing field sketches, and I really do, I sometimes can be disappointed in their quality. One solution I sometimes try is sketching from photos of the problem bird or species, hoping that I'll learn something in doing so. I'm not sure that this works. If it does it's much more indirect than you might expect. Rather than learning the structure of the bird while wokring from a photo it always seems more likely that I try to copy the patterns of dark and light that I see in the photo. Structure retreats to second place. To me that is what is always so tricky about using photos, and why I generally don't like to do so. I'd also written recently about the difficulty of knowing what to do when you run into a murky area on a photo of a bird you don't know well. What is the structure beneath the murk? Is an area part of the primary feathers, the rump, the tail? What do you do when an obstruction crosses the middle of the photo? If you know the structure well enough you can either just remove it or paint it without breaking the continuity of the bird. But if you don't know the structure you can end up with a mess. Often I avoid using this type of photo. So after looking through my sketchbooks yesterday I also looked through some photos. Some of the first I found were of American Redstarts, a beautiful wood warbler. And yet I've never worked from these photos. Why? Because not only were the photos murky the bird itself is murky. The male is a brilliant orange, black and white, with the female replacing the black with brown and the orange with yellow. It's the male that's the problem. When you look at it you mainly see a dark blob with some orange splashes of color. It is very difficult to see the structure of the bird, to even pick out the eye on the black face. So I had murky photos of a murky bird. No wonder I'd never done any work from these photos. And the photos were taken over numerous times and places. It's just that wood warblers rarely sit still long enough for photos, or particularly for field sketches. For the first time though I thought I might be familiar enough with the structure of birds and wood warblers in particular to try sketching them, confident that i would know what to do when I reached a murky area in the photo. So that's what you see above. I probably spent two hours or more on these small sketches. 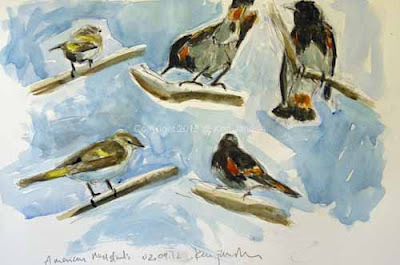 Once I felt that I'd sketched the structure of the birds to the best of my ability I added watercolor. That was another problem. 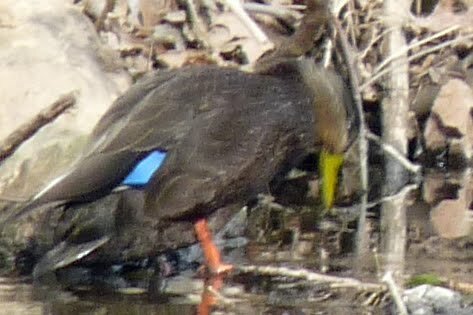 How do you show the structure on a bird that sometimes seems like a black blob? In fact portraying any black bird is difficult. It's easy to have it look flat. It's a far cry from the light breast and clear brown markings of a Song Sparrow. They lend themselves to volume. Black birds lend themselves to flatness. These are not my best watercolor sketches by far. They're not very fresh looking and they lack detail. But for me anyway they show that it is possible to use murky sources if you have some familiarity with the underlying subject. I doubt I ever would have tried anything from these bad photos if I hadn't spent a lot of time doing field sketches of other birds, especially the elusive wood warblers. It would be thrilling if this spring was the first time I did some field sketches of wood warblers that I really liked. We'll see. It's still a few months away. After a few hour out birding and sketching on a winter day it's always nice to come home and settle down with a book about the birds seen. Because it's not a picture book I often forget about Pete Dunne's 'Essential Field Guide Companion.' But when I remember to pull it out it's always a pleasure to read. Birds I wanted to look up that we'd seen today were Belted Kingfisher and Red-headed Woodpecker. But we'd also headed out to the Wissahickon today specifically hoping to see a Winter Wren. We found one a few weeks ago quite close to the tree where the Red-headed Woodpecker has been hanging out for months. But no luck today. Jerene caught a glimpse of a small wren but we never saw it again. Most likely it was a Winter Wren. But I really wanted to sketch it and a brief glimpse by someone else just wasn't enough material to work with. 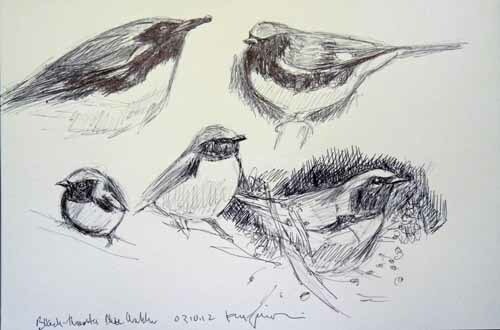 In any case I also read the entry on Winter Wrens. If you've ever read this book you know that you always need to pay attention. If you don't some clever thing is going to slip right by you. 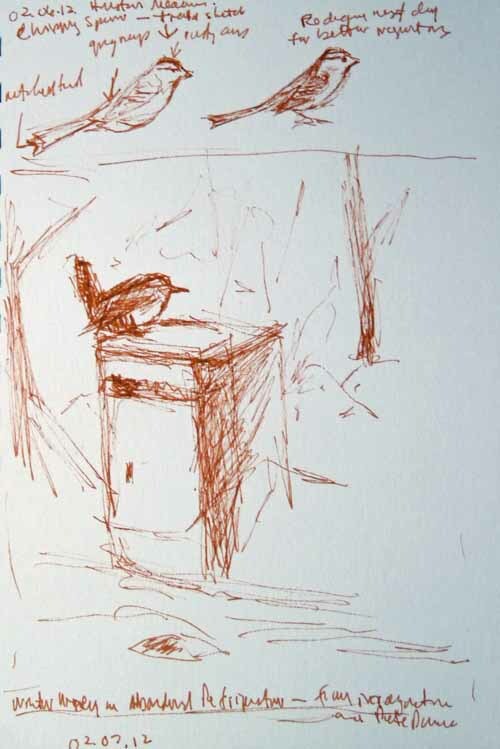 Today I was reading about a 'feathered mouse', which seemed factually accurate, which hops from "brush pile to uprooted tree stump to discarded refrigerator..." You can guess the part that's easy to miss. And yet it strikes you as true. It's not unreasonable to expect a discarded refrigerator along a stream where a Winter Wren might hop along like a mouse. I'm not an artist who can work well from imagination. My wife, who claims NOT to be an artist, can draw a bird from her imagination better than I can. But all my field sketching is making me a bit better. I've got a much better mental image of birds than I did five or six years ago. 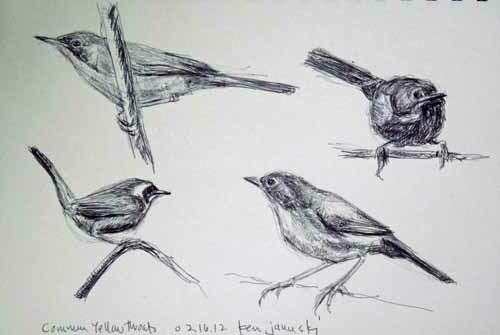 In my field sketches I often now spend most of my time looking at birds then try to draw them from a briefly held mental image. I'm getting better at mental images of birds. Not that I don't still come up with some whopping mistakes. In any case as I sat enjoying my coffee and reading about the Winter Wren hopping to the discarded refrigerator I couldn't resist trying an illustration of such from my imagination. It's at top. 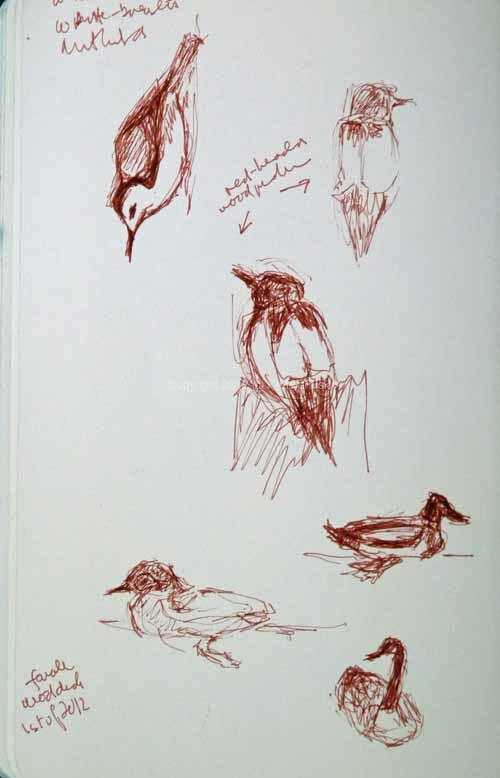 I sometimes think that the best way to do field sketches of fast-moving birds is to have a mental image at the ready, get that down on paper quickly and then spend the real work trying to delineate the specifics of the bird just seen. So even though we didn't see a Winter Wren today I had some semblance of a mental image. So that's how this came about. It's partly for fun but I imagine will also help me to do a better field sketch the next time I actually see a Winter Wren. Above it on the same page are two sketches of Chipping Sparrows. The one on the left is one that we saw at Houston Meadows in Philadelphia on Sunday. As with so many of my passerine field sketches I've elongated the torso. So the sketch at right is a mental image sketch based partially on the sketch at left but also on what I recall that I saw in my field guides and in actuality on Sunday. It seems like another worthwhile type of exercise. Above a small field sketch of a male Hooded Merganser seen very briefly at Morris Arboretum about a week ago. Everything I've read says that you should only put down on paper what you actually recall seeing when you do a field sketch. Often that looks incomplete so there's a real temptation to embellish. I did that here and really shouldn't have. I remembered black markings on the breast but not exactly where they were. My guesses were a bit off. Below him is a male Belted Kingfisher from today. There is a small bit of embellishment here but most of the sketch is from life. The odd thing is that the bill, seen at quite a distance through binoculars, really did look that thin. I have other field sketches where it looks more like the blunt shape it really is. Still I stayed true to what I saw. Finally a Great Blue Heron seen along the Manayunk Canal almost a month ago. I've also made his bill a bit too thin and long. Perhaps I'm just out of practice with bills. There's only one answer: more practice! This has been a bit of a ramble. But I did want to write some of my thoughts about field sketching. It's very difficult. And yet incredibly enjoyable. And it's these sketches from life that often lead to the best more finished art. This Saturday begins 'Art for Kids Sake' a fundraiser at MRAC (Manayunk Roxborough Art Center) for SuperKIDS. SuperKIDS was established in 1996 to aid abused and neglected children through opportunities and experiences that build self esteem, develop life long interests, and enhance strengths and talents. It will include works from the members of the Manayunk Roxborough Art Center, including my own. 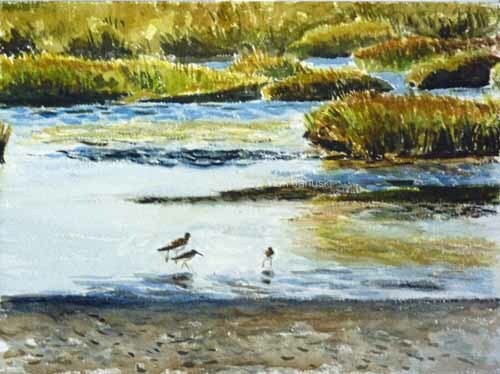 The opening reception runs from noon until 5 p.m. At 3 p.m. some writers from the Schuylkill Valley Writers at MRAC will present "WRITING AS A REFUGE AND HEALING"
as an additional part of the fundraiser. I'll be showing a number of works as part of the exhibit, which runs through February. At top is the newly matted and framed 'First Wood Ducks of Spring at Valley Green - Wissahickon' from early last spring. 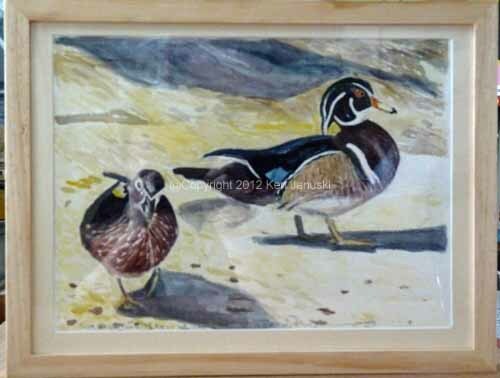 I'm also including two other watercolors and numerous prints, though only one, 'Louisiana Waterthrush with Ebony Jewelwing at the Wissahickon', is framed. The Louisiana Waterthrush print is from the Society of Wildlife Artist's Show in London from last fall. Some of the unframed prints are shown in plastic sleeves in photo above. 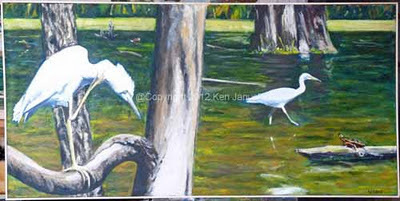 And finally I'll be including 'Little Blue Herons at Morris Arboretum'. This is the framed, finished version. Hope to see you there.